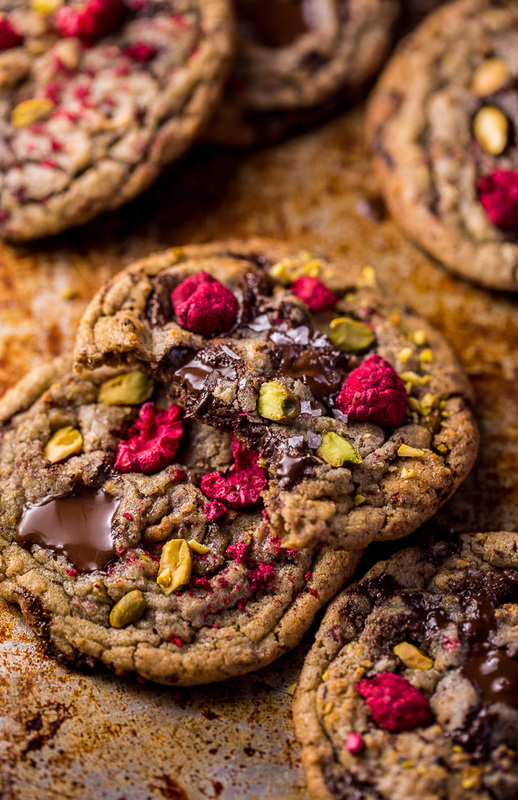 These Raspberry Pistachio Chocolate Chunk Cookies are thick, chewy, and so flavorful! Bonus: they’re super pretty, too! I’ve said it before, and I’ll say it again: cookies are my favorite. To bake, to eat, to photograph, and to share with you! I just love them. They’re the epitome of comfort food… and I usually can’t go a month without whipping up a dozen or two. But with all the rain we’ve been having here on the East Coast, it’s been more of a weekly affair. 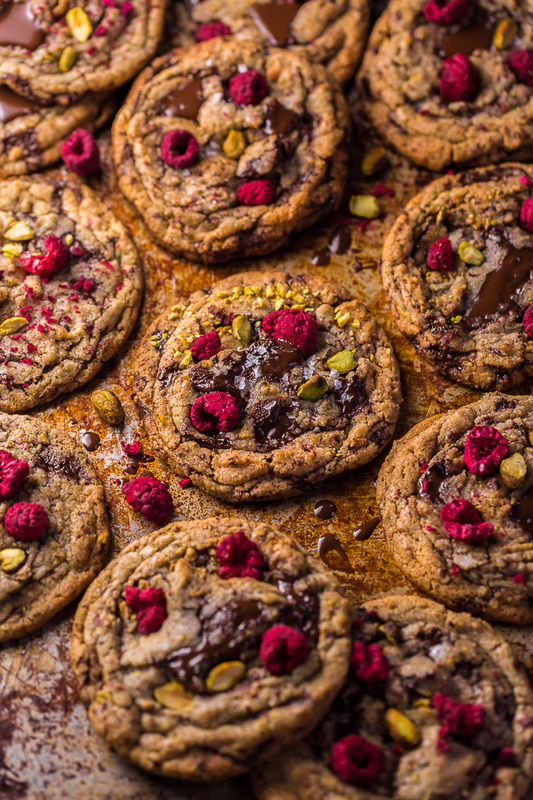 Because let’s be real… is there anything better than spending a rainy afternoon cozied up in the kitchen baking cookies? Answer: No. (But you already knew that ♥). 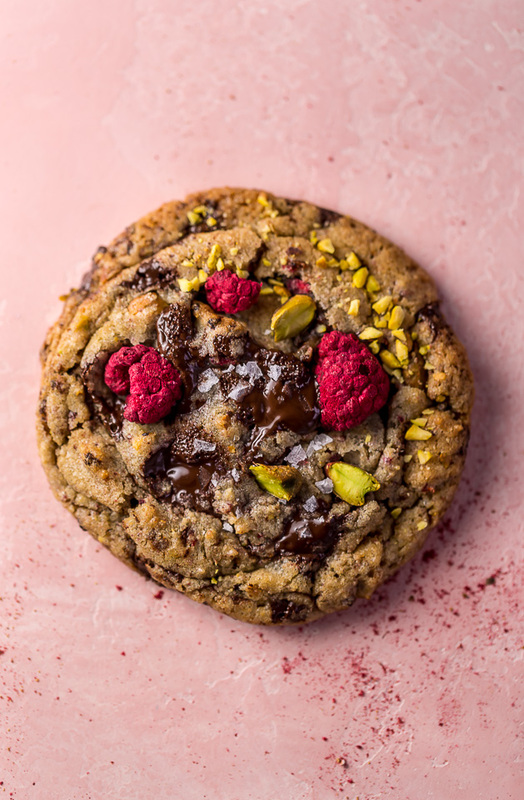 With Spring slightly in the air (I know it’s only February, but it’s also 61 degrees outside, so…) I wanted to share a cookie recipe with you that’s both comfortingly familiar and a little cutting edge in taste and texture. Because as a food blogger, I feel it’s important to stay fresh! And push the envelope a little with creativity. Plus, after chatting with you guys on Instagram, I know you’re ready to branch out in the kitchen this year and evolve as a baker! ← I’m so excited to do this with you! 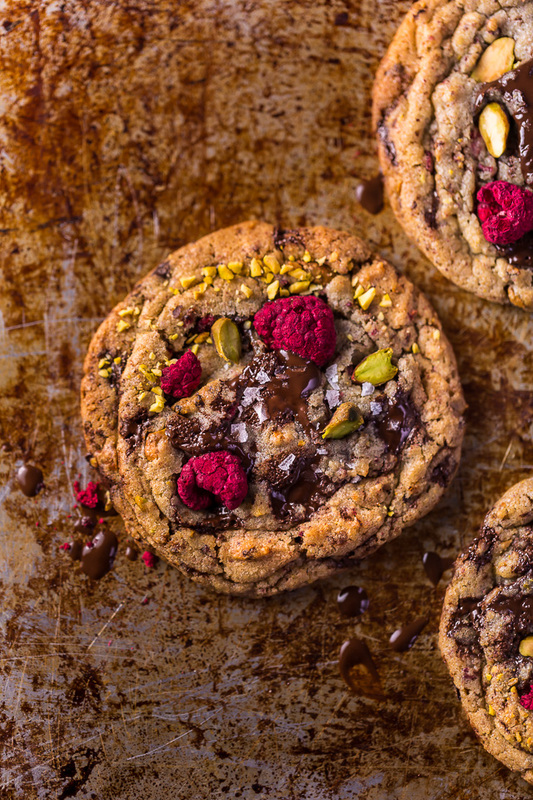 These cookies combine all of the flavors I’m obsessed with right now: toasted pistachios, bright raspberry, rich chocolate, musky vanilla, sweet almond, and perky sea salt! 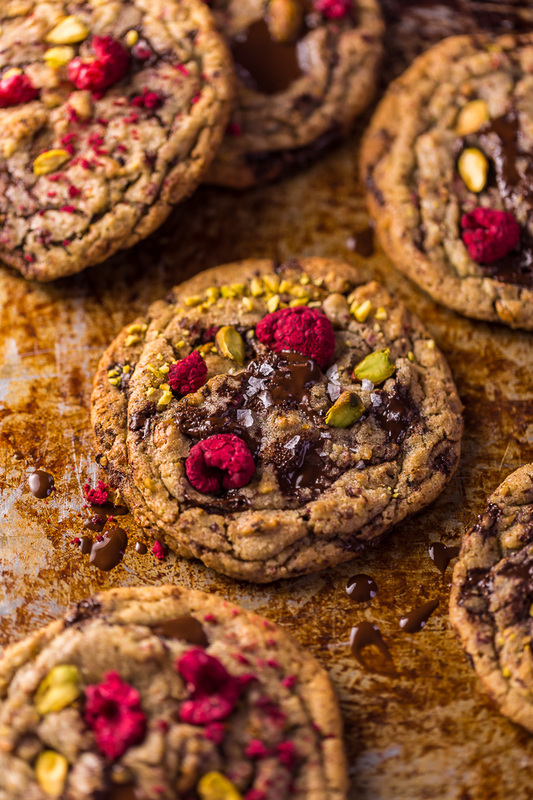 The combination of flavors may sound intense, but they actually blend together perfectly and create a cookie that’s vibrant, fresh, and insanely delicious. Just try and stop at one bite! To create a complex and interesting texture, I suggest chopping half of the pistachios and chocolate finely, and chopping the other half coarsely. Of course this is optional, but I find the contrast in texture is worth the extra step. Because I wanted to enhance the pistachio flavor without adding any artificial flavoring, I chose to use both vanilla and almond extracts in this recipe. And it really works! You can use semi-sweet chocolate, dark chocolate, or even white chocolate in this recipe! It really just depends on your taste buds. 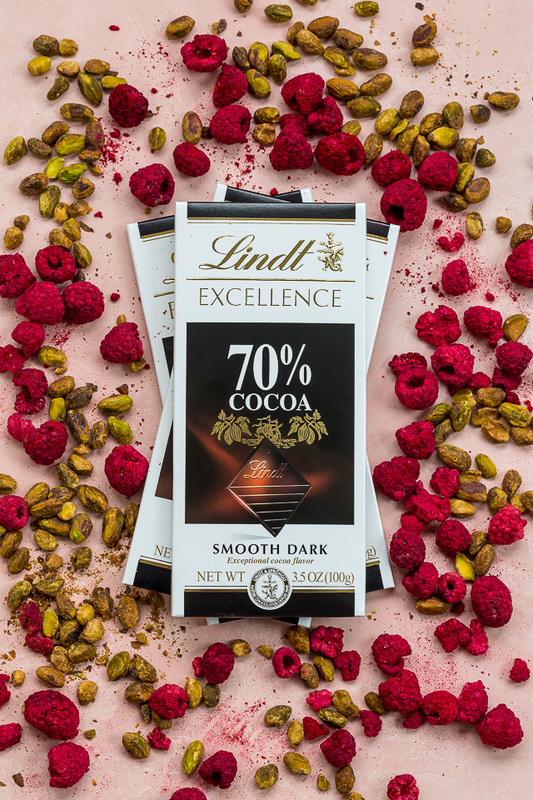 I prefer dark chocolate, and use Lindt 70%. If you cannot find bars of baking chocolate, feel free to use an equal amount of chocolate chips instead! Freeze dried raspberries can be found in most grocery stores, or even Target! And if you cannot find them, you can order them online here. I do not recommend using fresh or frozen raspberries in this recipe. It will not work. The flaky sea salt is an optional ingredient, but really makes the flavors in this recipe pop! I love maldon, but use whatever you have on hand. 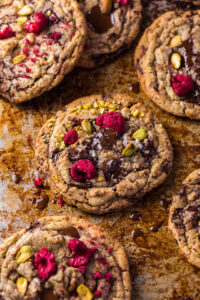 Finally, be sure you don’t over bake these cookies! They only need 9 minutes in the oven, and will firm up quite a bit as they cool. Over baked cookies will be dry and crumbly… not chewy like we want! 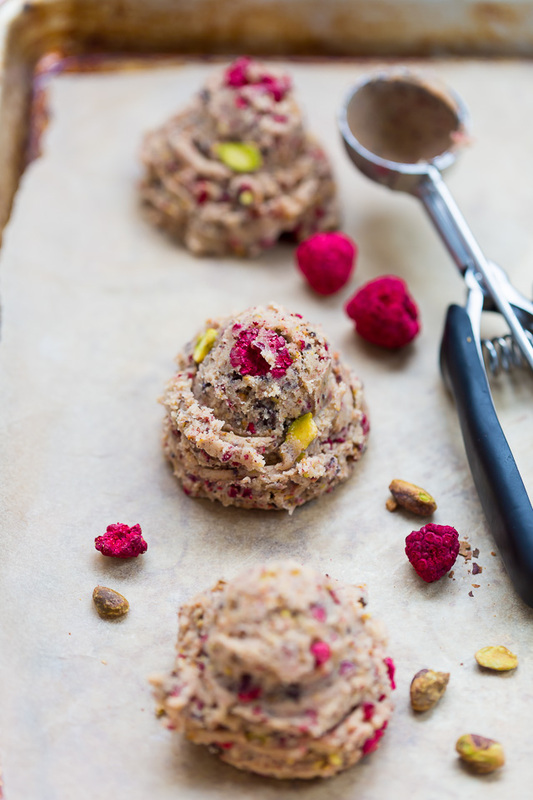 If you try this recipe for Raspberry Pistachio Chocolate Chunk Cookies, let me know! Leave a comment below and don’t forget to snap a pic and tag it #bakerbynature on instagram! Seeing your kitchen creations makes my day. 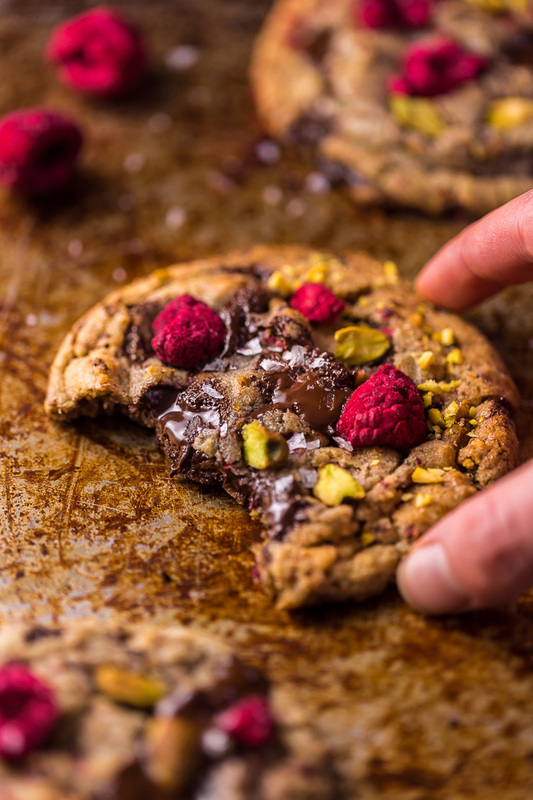 These Raspberry Pistachio Chocolate Chunk Cookies are thick, chewy, and so flavorful! Bonus: they're super pretty, too! Position a rack in the lower third of the oven. Preheat oven to 375 degrees (F). Line two large baking sheets with parchment paper and set them aside until needed. In a large mixing bowl combine the flour, salt and baking soda; whisk together until well combined and set aside. In the bowl of a stand mixer fitted with the paddle attachment, or in a large bowl using a handheld electric mixer, cream together the butter, vanilla, almond extract, and both sugars on medium speed until light and fluffy, about 3 minutes. Add in the eggs, beating well after each addition. Reduce mixer speed to low and add the dry ingredients in thirds, beating until just combined. 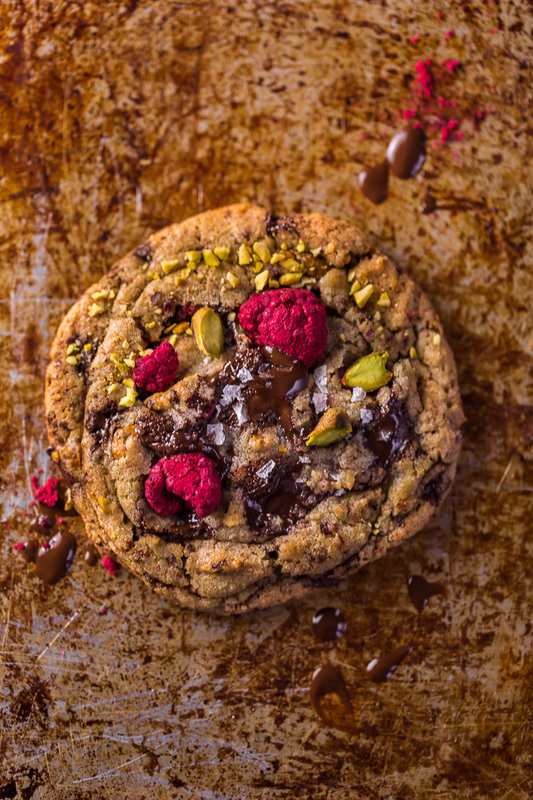 With the mixer running on low speed, add in the chocolate chunks and pistachios, and raspberries, and beat until just combined. Using a large cookie scoop, scoop level mounds of the batter onto the prepared baking sheets, spacing them 2 inches apart. Bake cookies, one sheet at a time, for 9 to 10 minutes, or until set at the edges but still soft in the center. Allow the cookies to cool on the baking sheet, placed on a cooling rack, for at least 10 minutes before transferring serving/eating/moving. Store cookies in an airtight container, at room temperature, for up to 5 days. These look delicious! I was wondering if I could replace the pistachios by pecans or walnuts? Looking forward to making them for a little party in a couple of weeks. Just made these tonight and they turned out SO GOOD. Wasn’t sure what to expect- I’ve never used freeze dried fruit in a cookie before! I followed the recipe exact and took your recommendation to chop half of the nuts and chocolate up fine. My family absolutely devoured these. I plan on making this every February now. Thank you for the recipe!